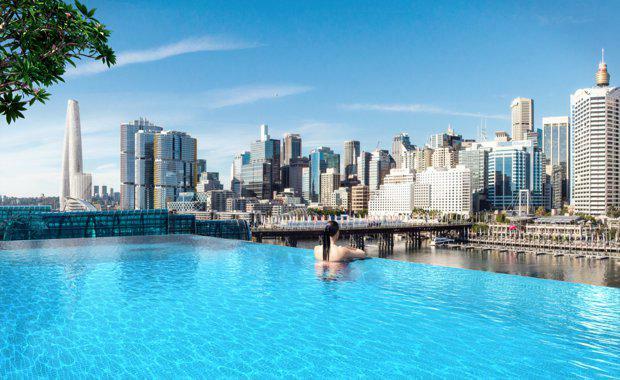 Lendlease has celebrated the start on site of Sydney’s largest 5-star CBD hotel, the 35 storey, circa 600 room ICC Sydney Hotel at Darling Harbour. The hotel is being developed, designed and constructed by property and infrastructure group Lendlease. It will be sold to investor, Dr Jerry Schwartz, upon completion and operated by French hotel manager AccorHotels under its luxury 5-star Sofitel brand. Lendlease was joined on site today by Minister for Trade, Tourism and Major Events, Stuart Ayres, as well as investor Dr Jerry Schwartz and operator AccorHotels Simon McGrath for a ceremony to mark the start of construction. Jonathan Emery, Managing Director, Urban Regeneration, Lendlease said, “We are thrilled to be developing the first new major luxury hotel in the Sydney CBD since the 2000 Olympics. We are proud to be working in partnership with the State Government, Dr Schwartz and AccorHotels on what will be a landmark building for Sydney. “Darling Harbour is one of Sydney’s most loved places, and the hotel is an integral part of the significant urban regeneration that is underway in the area. Our vision is that the hotel will become a meeting place for locals enjoying the reinvigorated public spaces, a luxury accommodation experience for guests and a red carpet arrivals destination for VIPs attending events in Sydney’s newest ballroom, next door at ICC Sydney. Click here to view a video animation of ICC Sydney Hotel.